Nature’s most violent storms, tornadoes are fast- spinning columns of air that reach from the base of a thunderstorm down to the ground, with wind speeds up to 300 miles per hour. Spawned from powerful thunderstorms, tornadoes can appear suddenly and without warning. 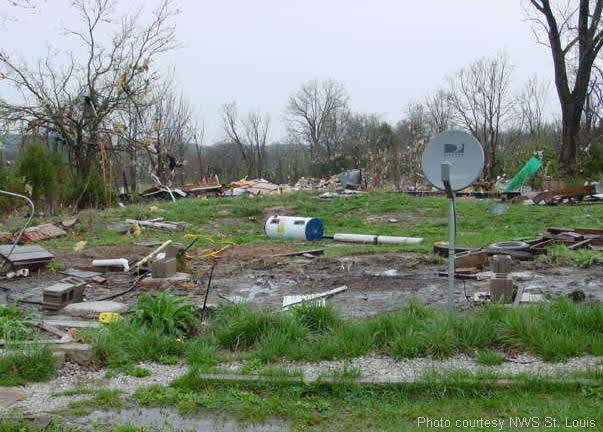 Tornadoes can cause fatalities and devastate a neighborhood in seconds. Damage paths from a tornado can be in excess of one mile wide and 50 miles long. Tornadoes come in many shapes and sizes. Some massive tornadoes are over a mile across, while others can be nearly invisible due to rain or low-hanging clouds. Often a cloud of debris, kicked up by the tornado’s winds, encircles the lower portion of the funnel. This debris cloud can mark the location of a tornado even when the funnel is not visible. The most devastating tornado ever to occur in the Northeast was the Worcester Tornado of June 9, 1953. The tornado hit Worcester at 5:08PM. Within one minute, more than 90 people were killed and over 1,300 injured. Damage estimates were in excess of $52 million. 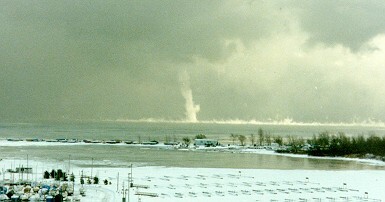 In one case, the Worcester Tornado carried pieces of mattresses high into the storm, where they were coated in ice before being dropped into Boston Harbor. 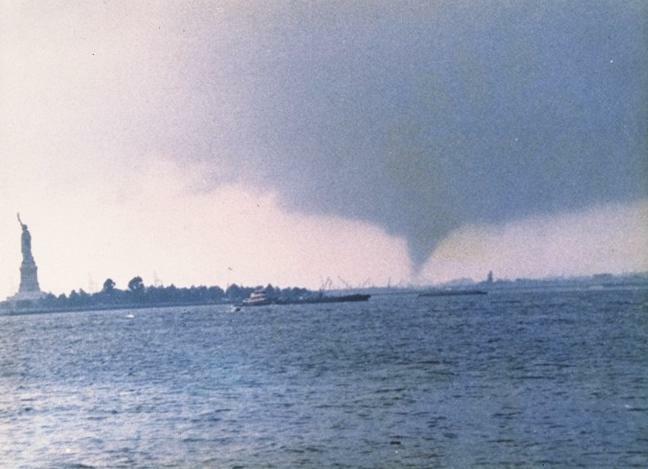 Another devastating tornado occurred in Windsor Locks, Connecticut at about 3PM on October 3, 1979. This twister lasted a little less than a minute, but killed 3 people, injure over 300, destroy 40 homes, and cause $300 million in property damage. In November of 1989, the East Coldenham Elementary School was hit by an F1 tornado. The tornado blew down a cafeteria wall, killing 8 students and injuring 18 others. On July 12, 2006 an F2 tornado touched down in Westchester County, NY, proving that devastating tornadoes can form even in the New York City area. The most recent tornado to hit New England was the New Hampshire tornado that struck on July 24, 2008. The tornado traveled through 11 towns, killing one person, collapsing over a dozen houses, and damaging 200 more. What is the Risk from Tornadoes in the Northeast? What is the Risk of a Tornado Occurring in the Northeast? Strong thunderstorms have been responsible for spawning tornadoes in many parts of the Northeast. On average six tornadoes per year touchdown somewhere in the Northeast. Many of these touch down in rural or uninhabited areas, but some have also touched down in densely populated cities and towns, leading to damage and loss of life. Where is the Biggest Risk From Tornadoes? While tornadoes can occur in every state in the U.S., some areas are more likely to have severe tornadoes than others. In the Northeast, the area from Albany, NY through central Massachusetts and into southern New Hampshire is at the most risk from tornadoes. Tornadoes can occur at any time of the year, although they are most common during the summer. The peak months for tornado formation in the Northeast are June through August, with the most tornadoes forming in August. On average the United States experiences 100,000 thunderstorms each year and approximately 1,000 tornadoes develop from these storms. Over 80% of tornadoes strike between noon and midnight. On average, a tornado will stay on the ground for no more than 20 minutes. Who Is Most At Risk from a Tornado? People in motor vehicles or people who live in mobile homes are at the most risk from a tornado. Mobile homes, even if tied down, offer little protection from tornadoes. Due to the high speed at which a tornado can travel, never try to outrun a tornado in a vehicle if you are in urban or congested areas. Instead, leave the vehicle immediately and seek better shelter. Tornados are very dangerous! 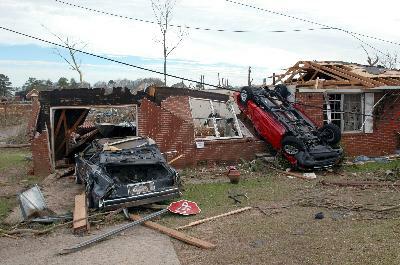 Many people are killed each year as tornadoes demolish buildings and hurl debris through the air at deadly speeds. 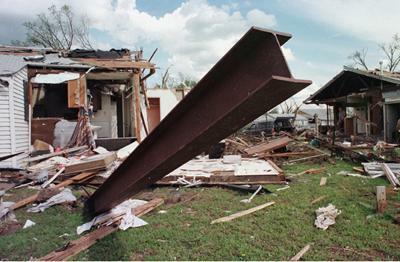 The severity of a tornado is measured by the Enhanced Fujita Scale which rates the damage a tornado on six levels, from minor (EF0) to catastrophic (EF5) The smallest tornadoes (EF1) have hurricane-force winds (EF1) while the largest (EF5) have devastating 300mph winds that can sweep homes right off their foundations and fling cars over a football field away. Fortunately, EF5 tornadoes are very rare. What is the Difference Between a “Tornado Watch” and a “Tornado Warning”? During a Tornado Watch, Tornadoes are possible. Prepare to take shelter if necessary, and remain alert for approaching storms. Watch the sky and stay tuned to NOAA Weather Radio, commercial radio, or television for further information. A Tornado Warning is issued if a tornado has actually been sighted on the ground in your area or is indicated by weather radar. If you are in an area with a tornado warning, follow the instructions of NOAA officials and SEEK SHELTER IMMEDIATELY! 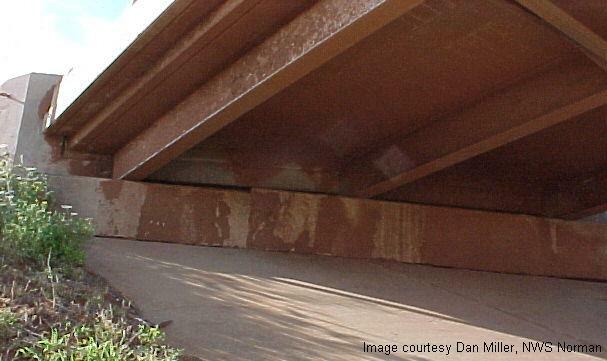 MYTH: Highway overpasses are good shelters from a tornado when you are on the road. Amazing footage taken by a television crew hiding from a tornado under an overpass in 1991 helped to spread the myth that bridge underpasses make good shelters from a tornado. Members of the television crew, and other travelers, survived by crawling well up into a high ledge underneath the bridge and bracing themselves against support columns while a weak tornado appeared to pass directly over the bridge. In reality, the tornado did not pass over the bridge. It was later discovered from the video footage that the tornado passed slightly south of the bridge and camera crew, exposing them to much weaker winds. Also, the tornado occurred in a remote area of Kansas where there was little debris for the tornado to pick up. Had this happened in an urban area, or had the tornado been stronger, the people would have been scoured and killed by the cloud of high-speed debris. Close to the center of a tornado, the high-speed winds rapidly switch direction as a tornado passes by, exposing everyone to deadly debris unless they are completely surrounded by walls on all sides. A highway overpass is an extremely dangerous place to be during a tornado! When directly hit by a tornado, the confined spaces beneath an overpass act like a wind tunnel and actually increase the speed of the tornado’s winds. The design of the overpass used by camera crew is also a rare one in the United States, which provided a crawl space to take shelter in and columns to hang onto to prevent from being sucked out into the tornado. The vast majority of overpasses in the U.S. are simply open slabs of concrete, offering no protection from wind and killer debris. Huddling under one of these overpasses does little more than raise you above ground level, exposing you to stronger winds and more of the deadly debris cloud. A few years after the TV crew video was taken, a tornado in Oklahoma struck 3 overpasses, killing people at each one. The body of one overpass victim was not found until one week after the tornado, buried underneath 6 to 8 feet of debris. In addition to the deaths, there were many severe, life-threatening, and gruesome injuries inflicted upon people underneath the overpasses by high-speed debris. 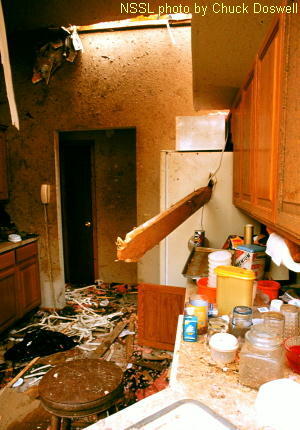 In some cases injuries from debris has left victims with permanent disabilities. The injuries included, but are not limited to: compound fractures and shattered bones, missing fingers and ears, and being impaled by pieces of roof shingles and two-by-fours. Another danger from seeking shelter under an overpass is the sheer number of people now congregating at underpasses during a thunderstorm. The crowds of people and cars converging at overpasses can completely block highways, potentially trapping other innocent motorists in the path of an oncoming tornado. These crowds also block emergency vehicles from getting to victims after the tornado passes. During the Oklahoma tornado that killed three people, an emergency manager was caught in a quarter-mile-long traffic jam at one of the three overpasses while attempting to get to the city’s Emergency Management Operations Center. If shelter is not available, lie flat in a ditch or other low-lying area. Be aware of the potential for flash flooding, so avoid getting stuck in a canal or drainage ditch. Do not get under an overpass or bridge. You are safer in a ditch or other low, flat location. MYTH: Opening windows when a tornado approaches will help prevent damage to your home. This myth is based on the idea that the low pressure in a tornado would cause a house to explode, and that opening windows will help to equalize pressure and save your house. In reality, opening windows allows the high-speed storm winds to enter your home, increasing the damage! When a tornado levels a home, it typically smashes the windows first. High-speed winds then rush into the home through the broken windows, pushing out the walls and up on the underside of the roof. Winds then lift the roof off. Without the roof, the side walls of the house lose structural support and fall outwards. From the wreckage left after a tornado, it may look like the house exploded, but this is not actually the case. MYTH: The southwest corner of a building is the safest spot to shelter in during a tornado. This is an old and dangerous myth. Since tornadoes usually come from the southwest, many people believe that huddling against the southwest corner of a building will give you the most protection from flying debris. In reality, the southwest corner is no safer than any other part of a building. A tornado’s rotating winds can blow debris from collapsing walls, floors and furniture into any corner of your building. Instead, get to the lowest floor of your building, and put as many walls as you can between you and the outside. Go to a small central room like a bathroom, closet, interior hallway with no windows, or get under a stairwell. Know where very heavy objects rest on the floor above (pianos, refrigerators, tubs, waterbeds, etc.) and do not go under them. Stay away from wide open rooms like cafeterias, and away from windows, doors and outside walls, including the southwest corner. 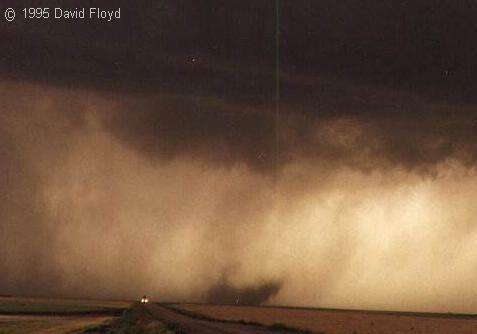 MYTH: Skinny tornadoes are weak, only the fat “Wedge-like” tornadoes are dangerous. With tornadoes, size does not necessarily indicate strength. Some thin tornadoes may look weaker, but the tightly circulating winds can be very intense, even stronger than the winds in a quarter-mile-wide tornado. In general, all tornadoes are dangerous, and all tornado watches and warnings should be taken very seriously. MYTH: In a trailer, RV, or mobile home, the best shelter from a tornado is in a closet or bathroom. Another dangerous myth. Actually, there is no safe place in a trailer or mobile home! Unlike a house, a mobile home can be easily torn apart by even the smallest tornadoes. Even if tied down, mobile homes offer little protection from tornadoes. In the event of a tornado, get out of a mobile home immediately and move quickly into a nearby storm shelter, or go to the lowest floor of a sturdy nearby building. You are probably safer outside, even if the only alternative is to seek cover in a low-lying ditch out in the open. Be aware of the potential for flooding, and avoid getting stuck in a canal or drainage ditch. MYTH: You can outrun a tornado by getting in your car and driving away. When in urban or congested areas, never try to outrun a tornado in a car or truck. Tornadoes can travel up to 70 miles per hour, and easily overtake your vehicle. 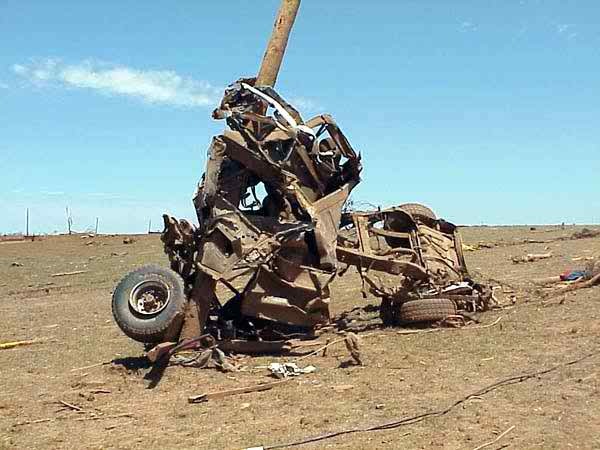 Vehicles are death traps in tornadoes because they can be easily tossed and destroyed. Instead, leave your vehicle and immediately head for safe shelter. Park safely out of the traffic lanes (which allows emergency vehicles to get to you and others), and seek shelter in a sturdy building. If no shelter is available, lie flat in a low spot, as far from the road as possible (to avoid debris and vehicles getting blown onto you). Be aware of the potential for flooding, and avoid getting stuck in a canal or drainage ditch. In wide open country with no traffic, however, the best option may be to escape by car if the tornado is far away from you. If the traffic allows, and the tornado is distant, you probably have time to drive out of its path. Watch the tornado closely for a few seconds, and compare its position to a fixed object close to you (such as a tree, pole, or other landmark). If the tornado appears to be moving to your right or left, it is thankfully not heading straight at you. Still, you should escape in the opposite direction the tornado is moving: to your right if the tornado is moving to your left, and to your left if the tornado is moving to your right. Put as much distance between you and its path as you can. If, however, the tornado appears to stay in the same place — not moving either right or left — then it is likely headed right at you. You must take shelter away from your car immediately! Do not seek shelter under an overpass. While an overpass might protect your car from hail, it offers no safety from a tornado. MYTH: Tornadoes can’t form near rivers or cross them. MYTH: Tornadoes can’t follow terrain into steep valleys or cross steep mountains. 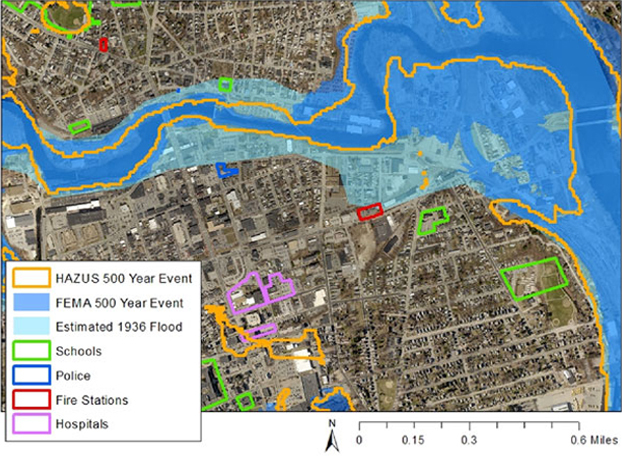 MYTH: Tornadoes can’t form in big cities. MYTH: Tornadoes can’t form in the winter. All these myths are untrue. 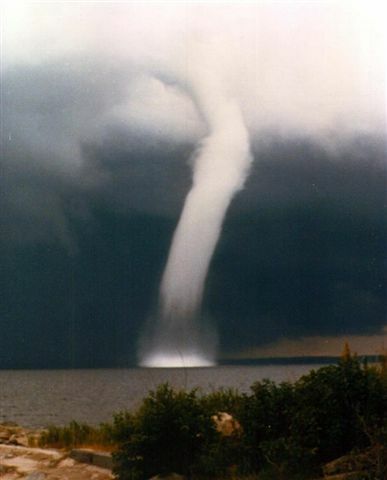 Tornadoes can cross bodies of water (these tornadoes are called waterspouts). They can form at high altitudes and they can easily cross extremely rugged or steep terrain. In March of 2000, a tornado ripped through the heart of downtown Fort Worth, Texas, proving that tornados can hit big cities. While tornadoes are rare in the extreme northern latitudes, they can form there too. In general, no place in the U.S. is immune from the threat of tornadoes, and all tornado watches and warnings should be taken very seriously. Weather forecasting science is not perfect and some tornadoes do occur without a NOAA tornado warning. There is no substitute for staying alert to the sky. Besides an obviously visible tornado, here are some clues to look and listen for. A strong thunderstorm with a strong, persistent rotation of low clouds near the bottom of the thunderstorm. Tornadoes can spawn from these low, rotating clouds. In the daytime, the sky might turn an eerie green color. It’s caused by sunlight refracting through thousands of tons of hail suspended near the core of the thunderstorm. Hail forms in intense thunderstorms with strong updrafts. While seeing hail is not a guarantee that a tornado is present, powerful thunderstorms that can produce hail may also have the power to produce tornados. Hail or heavy rain followed by either dead calm or a fast, intense wind shift. Many tornadoes are wrapped in heavy precipitation and can’t be seen, but their wind patters will still be noticeable. A loud, continuous roar or rumble, like a truck or freight train, which doesn’t fade after a few seconds like thunder would. Whirling dust or debris on the ground under the low, rotating clouds of a thunderstorm. Some tornadoes have no visible funnel. At night, look for small, bright, blue-green to white flashes near the ground under a thunderstorm (as opposed to the silvery flashes of lightning up in the clouds). These flashes are from power lines being snapped by very strong wind, maybe a tornado. At night, also look for a persistent low cloud hanging down from the storm, illuminated or silhouetted by lightning. This can be a tornado, especially if it is on the ground or there is a blue-green-white flashes of snapping power lines underneath. When a tornado watch is issued, think about your family tornado drill and where you will shelter. Check to make sure that your Disaster Supply Kit is handy, as you will need to stay in the shelter location until the danger has passed. Turn on local TV, radio or NOAA Weather Radio and stay alert for warnings. Forget the myth of opening windows to equalize pressure. If a tornado lands nearby, it will open your windows for you. If you spot a tornado, or if a Tornado Warning is issued on NOAA Weather Radio, take shelter immediately! Warnings can be issued less than a minute before a tornado can reach you. Move away from windows. Do not bother to open them. If you can, move into an underground storm shelter or Safe Room. These provide the best protection. Avoid windows. Get in the basement and under some kind of sturdy protection (heavy table or work bench), or cover yourself with a mattress or sleeping bag to protect you from flying debris. Know where very heavy objects rest on the floor above (pianos, refrigerators, tubs, waterbeds, etc.) and do not go under them. 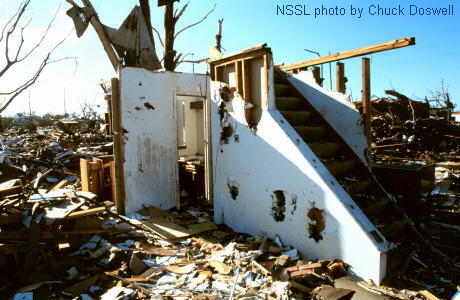 If a tornado hits your house, they may fall down through the weakened floor and crush you. Avoid windows. Go to the lowest floor, and into a small center room (like a bathroom or closet), or under a stairwell, or into an interior hallway with no windows. Crouch as low as possible to the floor, facing down; and cover your head with your hands. If you are in an interior bathroom, lying in the bath tub might offer you shell of partial protection. No matter where you are, you should get under some sturdy protection, if possible, and cover yourself with some sort of thick padding (mattress, blankets, etc. ), to protect against falling debris in case the roof and ceiling fail. Go directly to an enclosed, windowless area in the center of the building, on the lowest floor possible. Stay away from glass. Once there, crouch down and cover your head. Interior stairwells are usually good places to take shelter, and if not crowded, allow you to get to a lower level quickly. Stay off the elevators; you could be trapped in them if the power is cut. GET OUT! Even if your home is tied down, you are probably safer outside, even if the only alternative is to seek shelter out in the open. Most tornadoes can destroy even tied-down mobile homes. If your community has a tornado shelter, go there fast. If there is a sturdy permanent building within easy running distance, seek shelter there. Otherwise, lie flat on low ditch away from your home, protecting your head. If possible, use open ground away from trees and cars which can be blown onto you. Be aware of the potential for flooding, and avoid getting stuck in a canal or drainage ditch. Crouch as low as possible to the ground, facing down; and use your hands and arms to protect your head and neck. If you can, cover yourself with some sort of thick padding (mattress, blankets, etc. ), to protect against debris. Go directly to the lowest level of an enclosed, windowless area in the center of the building that is away from glass. Avoid wide-span roofs such as auditoriums, cafeterias, or large hallways. Once there, crouch down and cover your head. Interior stairwells are usually good places to take shelter, and if not crowded they allow you to get to a lower level quickly. Stay off the elevators; you could be trapped in them if power is lost. Follow the instructions of teachers and administrators. Go to the interior hall or room in an orderly manner. Crouch low, head down, and protect the back of your head with your arms. Stay away from windows and large open rooms like gyms, cafeterias, large hallways, and auditoriums. Watch for others. Move as quickly as possible to an interior bathroom, storage room or other small enclosed area that is away from windows. If possible, move quickly but in an orderly manner to an interior bathroom or hallway, away from windows. Crouch face-down and protect your head with your arms. If there is no time to do that, get under the seats or pews, protecting your head with your arms or hands. Crouch as low as possible to the floor, facing down; and use your hands and arms to protect your head and neck. If you can, cover yourself with some sort of thick padding (mattress, blankets, etc. ), to protect against debris. Vehicles are extremely dangerous places to be in a tornado. Especially if you are in urban or congested areas with traffic on the roads, do not try to outrun a tornado. Park the car as quickly and safely as possible out of the traffic lanes (which allows emergency vehicles to get to you and others). Get out and seek shelter in a sturdy building. 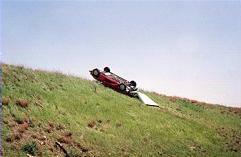 If you are away from buildings, run to low ground or ditch away from any cars (which may roll over onto you). Lie flat and face-down, protecting the back of your head and neck with your arms. Be aware of the potential for flooding, and avoid getting stuck in a canal or drainage ditch. Avoid seeking shelter under bridges and overpasses. When directly hit by a tornado, the confined space beneath an overpass acts like a wind tunnel and actually increases the speed of the tornado’s winds. Cars that have parked under bridges have been picked up by a tornado and thrown hundreds of yards away, killing the occupants. Bridges may protect your car’s finish from hail, but they offer little protection against flying debris in a tornado, which tends to move horizontally. Seeking shelter under an overpass is a bad decision that puts many more people than yourself into a life-threatening situation unnecessarily. In wide open country with no traffic, the best option may be to escape by carif the tornado is far away and not moving towards you. Tornadoes can travel at a forward speed of up to 70 mph, so you will not outrun a tornado if it is chasing you. If the traffic allows, and the tornado is distant, you probably have time to drive out of its path. Watch the tornado closely for a few seconds, and compare its position to a fixed object close to you (such as a tree, pole, or other landmark). If the tornado appears to be moving to your right or left, it is thankfully not heading straight at you. Still, you should escape in the opposite direction the tornado is moving: to your right if the tornado is moving to your left, and to your left if the tornado is moving to your right. Put as much distance between you and its path as you can. If, however, the tornado appears to stay in the same place — not moving either right or left — then it is likely headed right at you. You must take shelter away from your car immediately! If possible, seek shelter in a sturdy building. If not, lie flat and face-down on low ground, protecting the back of your head with your arms. Do not seek shelter under an overpass! When directly hit by a tornado, the confined space beneath an overpass acts like a wind tunnel and actuallyincreases the speed of the tornado’s winds. Bridges offer little protection against flying debris which tend to move horizontally and inflict gruesome and life-threatening injuries to people sheltering under overpasses. Wind speeds in a tornado actually approach zero in the few inches right at the ground surface, meaning that lying flat in a low ditch is actually a safer than seeking shelter tucked high up under a highway overpass. Get as far away from trees and cars as you can; as they may be blown onto you in a tornado. Stay in the shelter location until you are sure the dangers from the storm have passed. If you are trapped under debris, tap on a pipe or wall so rescuers can locate you. Whistle or use a cell phone if one is working. If there is lots of dust from debris, shout only as a last resort. Shouting can cause you to inhale dangerous amounts of potentially toxic dust. Stay out of any heavily damaged houses or buildings; they could collapse at any time. Carefully render aid to those who are injured. Check on others who may require special assistance, such as the elderly, children, and people with disabilities. Stay away from power lines and puddles with wires in them, as they may still be carrying electricity. Do not use matches or lighters in case there are leaking natural gas pipes or fuel tanks nearby. Remain calm and alert, and listen for information and instructions from emergency crews or local officials. Learn where you can find emergency weather bulletins in your community. A few communities in the northeast might have tornado sirens, but most do not. You should listen to NOAA Weather Radio, local radio, and television news outlets during severe weather to learn the latest storm developments. Consider purchasing a NOAA Weather Radio with a tone-alert feature to keep you aware of watches and warnings while you are hiking, traveling, or sleeping. At home, plan with your family on what to do if a Tornado Warning is issued. Your family tornado plan should be based on the kind of house you live in (basement, no basement, trailer, high-rise, etc.) and on the safety tips listed here. Choose a shelter location in your house based on the safety tips on this page. Use a storm shelter or safe room if you have one. Make sure there are no windows or glass doors in your shelter location, and keep it uncluttered in case of emergency. Make sure all your family members know where to take shelter during a tornado, and practice a family tornado drill at least once a year to make sure that your family can get to shelter quickly. Check with your work and your children’s schools and day care centers to learn of their tornado emergency plans. Every building has a different safety plan, and it is important to know where they are and how to get to your kids during an emergency. Have a plan in place on what to do and where and how to meet up after a disaster, in case all family members are not together when a tornado strikes. Flying debris are the greatest danger during a tornado, so store protective coverings (mattress, sleeping bags, thick blankets, etc.) in or near your shelter, ready to use at a moment’s notice. You can also add thick blankets and sleeping bags to your Disaster Supply Kit, since you will also need them for winter storms and blackouts. Keep your Disaster Supply Kit near your shelter. If you shop frequently at certain stores, know where the bathrooms, storage rooms or other windowless interior rooms are located, and find the shortest ways to get there. These rooms will become your improvised shelters should a tornado strike while you are at these stores. If you are planning to build a house, consider adding an underground tornado shelter or safe room to your building plans. Ensure that Administrators of schools, shopping centers, nursing homes, hospitals, sports arenas, stadiums, mobile home communities and offices have a shelter-in-place safety plan, with easy-to-read signs or personnel instructed to direct everyone to a safe, close-by shelter area. Schools and office building managers should also run well-coordinated drills. Include procurement and distribution of NOAA Weather Radios schools and other key facilities in their community mitigation programs. Construct community storm shelters where appropriate and distribute information regarding safe room construction for homes. Early warning systems such as sirens and other community emergency communication systems are also important tornado mitigation measures. Tornadoes may strike very quickly, with little or no warning. Tornadoes may appear nearly transparent until dust and debris are picked up into the funnel. The average forward speed of a tornado is 30 mph, but tornadoes have been known to be may stationary, or to move up to to 70 mph. Tornadoes are most likely to occur between 3PM and 9PM, but can occur at any time of the day or night.